Wow! I never expected the response I got to my last post “It’s My Pity Party……”. I try not to share the down-side of having Parkinson’s. My goal is to write about living well with Parkinson’s. However, the reality is that we all have bad days, so why not talk about them once in a while. Apparently, it hit a nerve and the post was shared and shared and shared again. The comments on Facebook prompted conversations among readers and it was fascinating to watch it unfold. The power of the Internet never ceases to amaze me. “I am amazed that a complete stranger can feel my thoughts, pain and fears so intimately. Thank you so very much for sharing! This last comment almost brought me to tears. I think that no one can describe accurately what it feels like to have PD (or any other chronic disease) unless they actually have it. 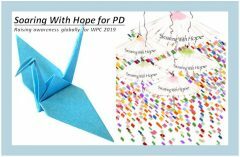 Although each of our experiences with PD is different, there are many commonalities which bind us together. I would like to clarify one point that I made. If you are overwhelmed by all the things that you HAVE to do, you are in charge of your life, so you can make changes. YOU have the power to decide whether you want to do all the things you “have to” do, or if you can pursue the things you “want to” do. Finding a balance between the two is difficult. You may find that because of your Parkinson’s you either can no longer do some of the things you enjoyed before, or you have lost interest in many of them. The experts say the best thing to do for your brain is to learn something new every day. Why not take music lessons? A painting class? Take a class through the extension program at your local university. You may find a new passion that will give you a reason not to stay in bed all day. And, by the way, you can still eat your chocolate, too.